Dot Belstler’s first Pride was in 2009. She had been invited to volunteer at the festival in Loring Park and, wanting to educate herself about the history of Pride and the GLBT community, she found herself in the GLBT History Pavilion, poring over panels from the University of Minnesota’s Tretter collection that detailed the community’s historical context. “I spent two hours in that pavilion, reading and crying. It was really emotional, but I stuck with it and read every one of the panels,” says Belstler. “I was so engrossed and impressed, and that’s what made me think, ‘I want to work with this organization.’” She became the executive director of Twin Cities Pride later that year. This year, the pavilion’s display will take an even deeper dive into the fraught and formative early days of the GLBT civil rights movement. The Minnesota State Arts Board provided Twin Cities Pride with a grant to produce Living History, a new oral history project that aims to capture stories from the people who experienced and shaped the history of the GLBT movement in Minnesota. Twin Cities Pride will work in conjunction with Twin Cities Public Television (TPT), which is working on a Minnesota queer history documentary of its own, to create a series of three-to-five-minute video snippets featuring individuals who have been on the front lines of the evolving GLBT movement in Minnesota. One of the first people they plan to interview is Jean-Nickolaus Tretter. 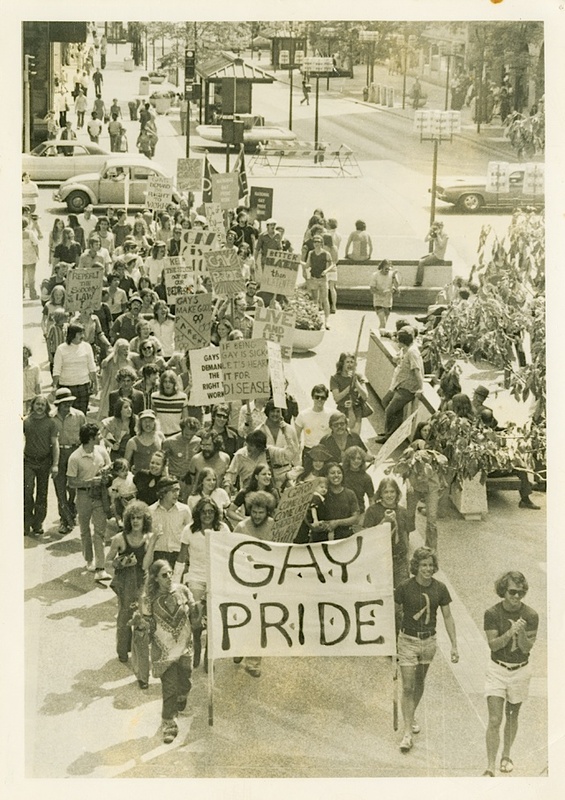 In 1972, Tretter and his friends organized a commemoration of the Stonewall Riots in the Twin Cities, a celebration that evolved over 40 years to become one of the largest Pride festivals in the country. In the early ’70s, Tretter also began collecting gay and lesbian materials, which eventually grew to represent the state’s largest library of GLBT historical materials. The Tretter Collection is now housed at the University of Minnesota and displayed, in part, in the pavilion at Loring Park every year during Pride, where it will be augmented this year by the first of the recorded video segments. Belstler is hoping that the Pride festival will also serve as a fertile gathering ground to capture stories from attendees. While the exact location is yet to be determined, a private recording booth will be set up at the park, and people will be invited to come inside and share stories of their first experience at Pride. The hope is that Living History will grow into a long-term project that Twin Cities Pride can feature on its website, bring to schools, and use to contribute to our collective knowledge and understanding of the many faces and facets of GLBT history. “We have the opportunity to capture these stories and share them more broadly,” says Belstler.